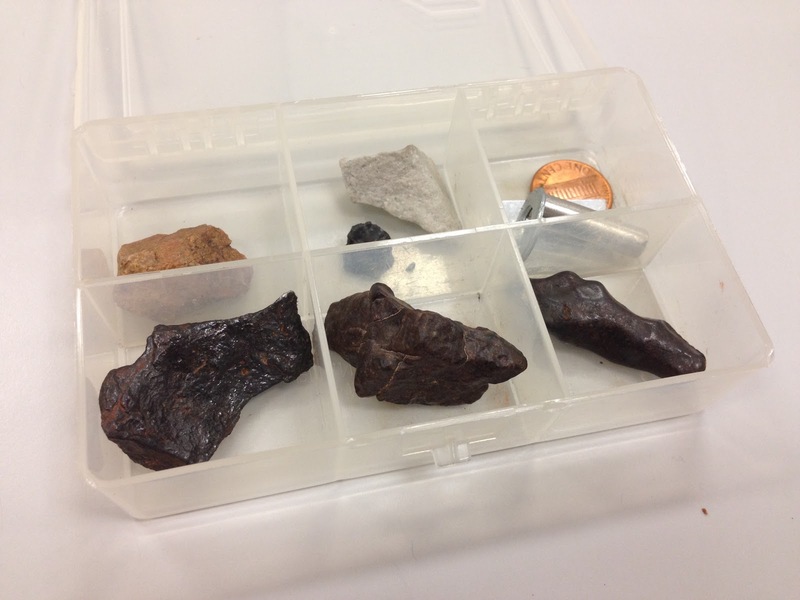 Last night the Indiana Astronomical Society hosted a presentation on meteorites by Dr. Fritz Kleinhans, associate professor of physics at Indiana University-Purdue University Indianapolis (IUPUI). I arrived late because I had trouble finding the Holcomb Observatory and Planetarium on campus at Butler University. I also had to drive slow because there were a lot of college Halloween parties going on and pedestrians were darting out of the shadows all around me! Fritz brought these kits of samples, and we got to identify 4 meteorites from a lineup of 6 objects. He had 30 kits for us to use, that's a lot of meteorites! A piece of the Chelyabinsk meteor that lit up the Russian sky in February of this year. 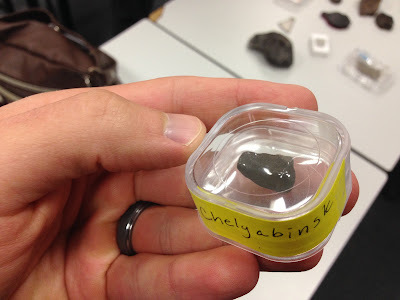 This meteorite, from Fritz' personal collection, must have cost a pretty penny! The Chelyabinsk meteor was a once in a century event, and is the most-photographed meteor air burst in history. I also won a door prize, a copy of The Universe and Beyond 4th Edition. Woo!